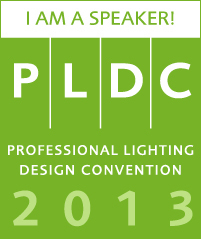 I am proud to be one of this year’s PLD-C speakers! My paper is scheduled for Friday, 1. November, 2013. It is intended to provide a series of easy to use tools for the management of a Lighting design practice. Is is meant for those who need information on how to start the business or restructure an existing one correctly. The paper is for those who run a business in a satisfying way but wish to evaluate tools and methods. I hope to see you in the audience! If you have not already registered for PLDC 2013, you can use the form at http://www.pld-c.com/registration/ The convention organisers offer one-day, two-day or full convention tickets - whatever suits your schedule! I look forward to seeing you in Copenhagen!